Redo of a corny Dutch Custom. Brighten up any room *like the toilet* with these tiles. Great of you to drop by and take a look at my tiles! I hope you like them. Yeah, what are they? Well, in Holland they sell these 'wisdom tiles'. These tiles usually are white with Delft blue lettering. Just search for 'tegeltjes wijsheden' (Dutch for wisdom on little tiles) and you'll know what I'm talking about. People hang these tiles on walls. I don't know if people do the same in other countries, let me know if they do). These tiles, even though they often are funny or wise, are quite corny... So time for a redo! In stead of square tiles, I used the lids from my "Cute Christmas Candles With Snow, Snowflake And A Little Bow" project (go and take a look if you like to). I made the whole tile blue and made the lettering white. This is the opposite of the 'real deal'. 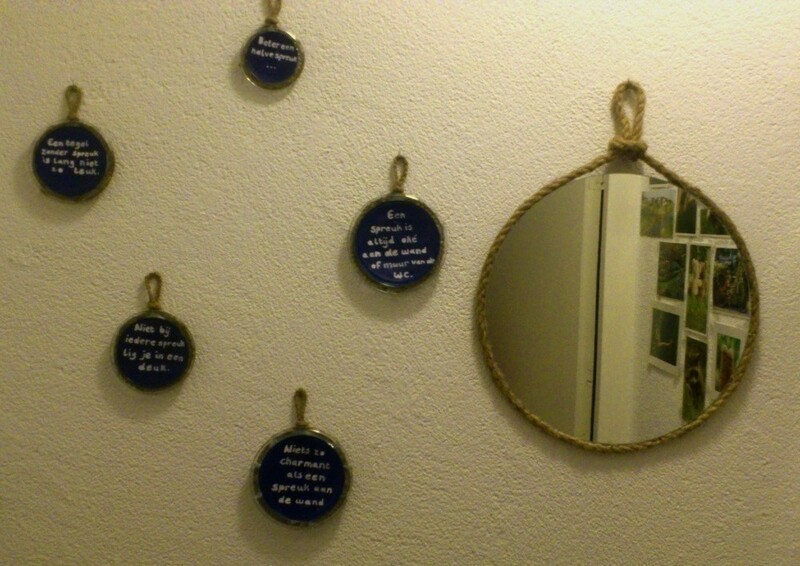 To hang these tiles, I used braided twine and hot glue. Read the How-to if you'd like to make one (or two) yourself. I'm really curious what you think of these things. Just let me know! Sorry, no pictures for this project, but it was quite easy to make if you have all the supplies listed. Make small balls of the clay and spread them evenly over the lid. If you like to, you can make the centre lower than the edges, this is easier to make. When the clay is dry, you can paint it the colour you want. Your tile must say something funny, smart or wise. It can rime if you want to. The sayings on my tiles all say something about sayings. 2. Groot of klein, een spreuk is altijd fijn. 3. Een tegel zonder spreuk is lang niet zo leuk. 4. Niet bij iedere spreuk lig je in een deuk. 5. 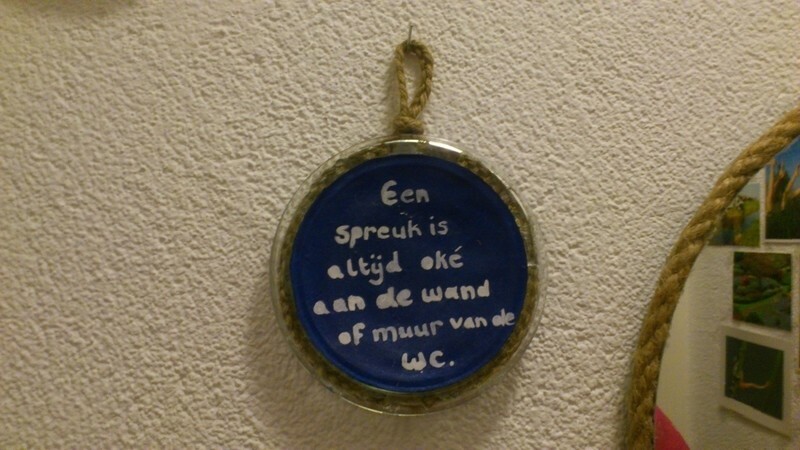 Niets zo charmant als een spreuk aan de wand. 6. 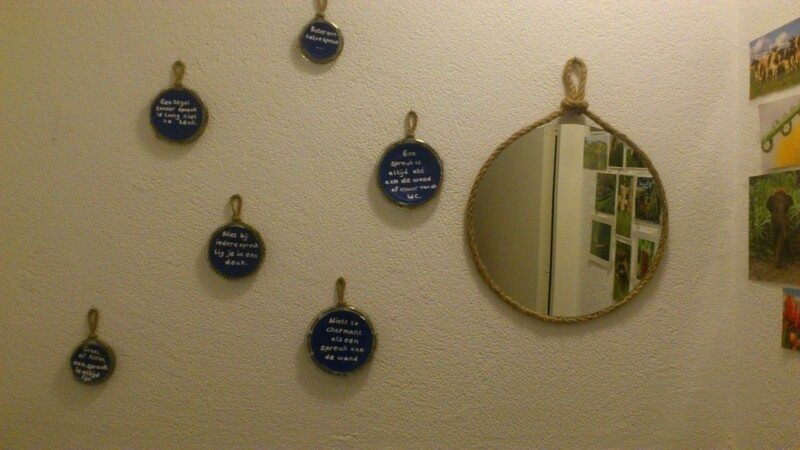 Al zit je hier een uur, blijft leuk met die spreuken aan de muur. 7. Een spreuk is altijd oké, aan de wand of muur van de wc. When the paint is dry, you can do the lettering for your sayings/wisdoms. I used a white pencil to write down what I wanted and to make guidelines. Practice painting the lettering before your really start to work on your tile. By using your own handwriting, the chances are smaller of making mistakes or having one word bigger than another. Make braids out of twine and knot one end to make a loop where you can hang your tile from. Use a glue gun to glue the twine to the lid and to glue the clay to it, if necessary. 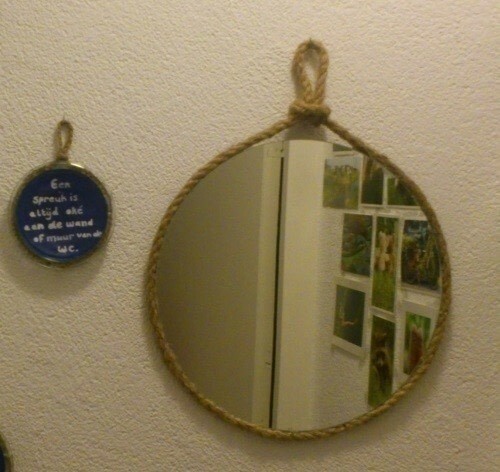 To make sure the mirror wasn't going anywhere, I also used duct tape at the back of the mirror and the rope.